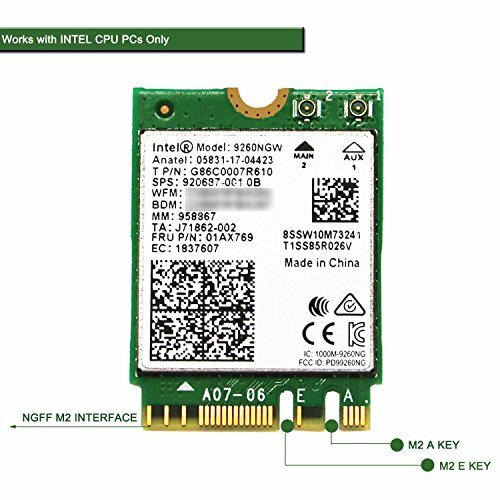 Intel Dual Band Wireless-AC 9260 NGW Wireless Bluetooth Adapter is designed for Intel inside Processor Computers Only. It will provide 2X2 wave (Stream) wireless AC network connection, allow computers get 300Mbps (40MHz) on 2.4GHz or1733Mbps (160MHz) 867Mbps (80MHz) on 5GHz for 4K video source streaming or office use. At the same time the NGFF M2 2230 interface will make sure computers get a Bluetooth 5.0 for Bluetooth device such as keyboards, mouse, headset etc make sure device get a stable long range connectivity. Advanced low power consumption design to extend PCs working time. Compatible with Windows 10 (32/64bit) only not for other systems. Works on Intel inside Processor PCs only, not for AMD processor PCs. Wi-Fi Speed May vary depends on user's wireless network condition. Users may get a speed lower than 867Mbps if wireless modem does not support IEEE 802.11 AC 160MHz. Model: Intel Dual Band Wireless-AC 9260 NGW; Operation Environment: works on Intel inside processor (CPU) computers only. Advanced low power consumption technology to extend PC working time. Max Data Throughput: 2.4GHz 300Mbps (40MHz) or 5GHz 1733Mbps (160MHz), 867Mbps (80MHz); Form Factors: NGFF M2 2230 A and E key. Package: PE bag, no driver CD inside. Product Dimension: 22X30X2.4 mm; Item Weight: 2.9g; Wireless Security Encryption: 64bit and 128 bit WEP, AES-CCMP and TKIP. If you have any questions about this product by NETELY, contact us by completing and submitting the form below. If you are looking for a specif part number, please include it with your message.